Product prices and availability are accurate as of 2019-04-11 22:02:22 EDT and are subject to change. Any price and availability information displayed on http://www.amazon.com/ at the time of purchase will apply to the purchase of this product. This HP ProLiant DL380 Generation 4 (G4) 2U Server provides the computing power you need to manage a small or medium-sized business! This ProLiant DL380 G4 is powered by two Intel Xeon 3.6 GHz processors and 4 GB of DDR2 RAM. Store your applications on one 146 GB 15,000 RPM SCSI hard drive. Access media and install software with the DVD-ROM drive! 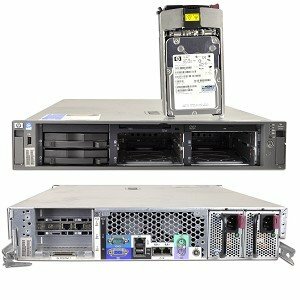 Other features include the integrated Lights-Out (iLO) Network Management, dual integrated NC7782 PCI-X Gigabit Ethernet network controllers, integrated ATI Rage XL video controller with 8 MB SDRAM video memory, and two 575-watt power supplies! Eight system fans help keep the HP ProLiant DL380 nice and cool! Add the operating system and connect the peripherals to complete this system! Order today!